Tax planning for investments demands careful thought. You must consider the tax consequences of your investments as you buy and sell, but not let tax concerns propel your investment decisions. Your investment goals, time horizon, risk tolerance and factors related to the investment itself also should come into play. Nevertheless, tax factors are important. Here’s a look at what you need to know. Use unrealized losses to absorb gains. 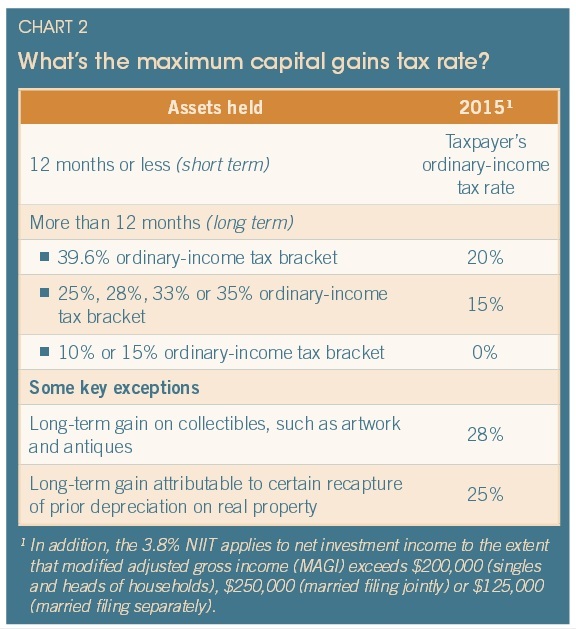 To determine capital gains tax liability, realized capital gains are netted against any realized capital losses. Both long- and short-term gains and losses can offset one another. If you’ve cashed in some big gains during the year and want to reduce your 2015 tax liability, before year end look for unrealized losses in your portfolio and consider selling them to offset your gains. Avoid wash sales. If you want to achieve a tax loss with minimal change in your portfolio’s asset allocation, keep in mind the wash sale rule. It prevents you from taking a loss on a security if you buy a substantially identical security (or an option to buy such a security) within 30 days before or after you sell the security that created the loss. You can then recognize the loss only when you sell the replacement security. Hector purchases 200 shares of an equity mutual fund on Dec. 1, 2015, at $100 per share, for a total investment of $20,000. The next week, the fund makes a capital gains distribution of $15 per share. Hector ends up with capital gains of $3,000, reportable on his 2015 return. It doesn’t matter whether the actual value of the shares has increased or even decreased since Hector purchased them, or whether he reinvests the proceeds back into the same fund. Why? The distribution itself is a taxable event. If capital gains distributions from the mutual fund are reinvested in the fund, the distribution itself doesn’t change Hector’s value in the fund. It simply increases the number of shares he owns, yet now at a lower per-share value. Fortunately, there are ways to avoid triggering the wash sale rule and still achieve your goals. For example, you can immediately buy securities of a different company in the same industry or shares in a mutual fund that holds securities much like the ones you sold. Or, you can wait 31 days to repurchase the same security. Alternatively, before selling the security, you can purchase additional shares of that security equal to the number you want to sell at a loss, and then wait 31 days to sell the original portion. Swap your bonds. With a bond swap, you sell a bond, take a loss and then immediately buy another bond of similar quality and duration from a different issuer. Generally, the wash sale rule doesn’t apply because the bonds aren’t considered substantially identical. Thus, you achieve a tax loss with virtually no change in economic position. Mind your mutual funds. Mutual funds with high turnover rates can create income that’s taxed at ordinary-income rates. Choosing funds that provide primarily long-term gains can save you more tax dollars because of the lower long-term rates. Also pay attention to earnings reinvestments. Unless you or your investment advisor increases your basis accordingly, you may report more gain than required when you sell the fund. Since 2012, brokerage firms have been required to track (and report to the IRS) your cost basis in mutual funds acquired during the tax year. Finally, beware of buying equity mutual fund shares late in the year. Such funds often declare a large capital gains distribution at year end. If you own the shares on the distribution’s record date, you’ll be taxed on the full distribution amount even if it includes significant gains realized by the fund before you owned the shares. See Case Study II. See if a loved one qualifies for the 0% rate. The 0% rate applies to long-term gain that would be taxed at 10% or 15% based on the taxpayer’s ordinary-income rate. If you have adult children in one of these tax brackets, consider transferring appreciated assets to them so they can sell the assets and enjoy the 0% rate. This strategy can be even more powerful if you’d be subject to the 3.8% NIIT (see page 13) and/or the 20% long-term capital gains rate if you sold the assets. If net losses exceed net gains, you can deduct only $3,000 ($1,500 for married taxpayers filing separately) of the net losses per year against dividends or ordinary income (such as wages, self-employment and business income, and interest). You can carry forward excess losses indefinitely. Loss carryovers can be a powerful tax-saving tool in future years if you have a large investment portfolio, real estate holdings or a closely held business that might generate substantial future capital gains. Finally, remember that capital gains distributions from mutual funds can also absorb capital losses. Dividend-producing investments. Qualified dividends are taxed at the favorable long-term capital gains tax rate rather than at your higher ordinary-income tax rate. Interest-producing investments. Interest income generally is taxed at ordinary-income rates. So stocks that pay qualified dividends may be more attractive tax-wise than other income investments, such as CDs and taxable bonds. But nontax issues must be considered as well, such as investment risk, rate of return, and diversification. Interest on U.S. government bonds is taxable on federal returns but exempt by law on state and local returns. Interest on state and local government bonds is excludable on federal returns. If the bonds were issued in your home state, interest also may be excludable on your state return. Tax-exempt interest from certain private-activity municipal bonds can trigger or increase the AMT (see page 2) in some situations. Corporate bond interest is fully taxable for federal and state purposes. Bonds (except U.S. savings bonds) with original issue discount build up “interest” as they rise toward maturity. You’re generally considered to earn a portion of that interest annually — even though the bonds don’t pay this interest annually — and you must pay tax on it. Stock options. Before exercising (or postponing exercise of) options or selling stock purchased via an exercise, consult your tax advisor about the complicated rules that may trigger regular tax or AMT liability. He or she can help you plan accordingly. Taxpayers with modified adjusted gross income (MAGI) over $200,000 per year ($250,000 for joint filers and $125,000 for married filing sepa-rately) may owe the net investment income tax, in addition to other taxes already discussed here. The NIIT equals 3.8% of the lesser of your net investment income or the amount by which your MAGI exceeds the applicable threshold. Net investment income can include capital gains, dividends, interest and other investment-related income. The rules are somewhat complex, so consult your tax advisor for more information. Many of the strategies that can help you save or defer income tax on your investments can also help you avoid or defer NIIT liability. And because the threshold for the NIIT is based on MAGI, strategies that reduce your MAGI — such as making retirement plan contributions (see page 22) — could also help you avoid or reduce NIIT liability.